If you live very close to a likely nuclear bomb target you do not have much chance of surviving. You can think about it a little and know what a lot of these sort of targets would be. Fortunately, you don't have to be a rocket scientist to figure this out. Some examples of must-shoot-targets would be important military bases, like where I grew up during part of my childhood. That was Vandenberg Air Force Base. If you live near one of these places, I suggest you either move, or get a bug out location far away and spend as much of your time there as possible. You can hope the nuke hits while you are at your bug out location. If you can not manage a bug out location and you are stuck in a nukeable location, I recommend gallows humor. My siblings and I found this very helpful. During the Cuban missile crisis we lived a lot less than a hundred miles from Vandenberg Air Force Base. We were acutely aware that we were toast if missiles started flying. We used to joke about whether we would be parboiled or incinerated if the water evaporated when a missile struck while we were in the bathtub. This struck us as hilarious to the consternation of our, possibly more sane, mother. I have found some sites with cute little calculators on them, so you can calculate whether you will be baked, broiled or fried, or should go ahead and build a fallout shelter. I would build one as long as I lived at least 12-15 miles from a nukeable location. I live in Alaska, but am too close to a military base to survive a hit now. Gallows humor it is. I also am making plans to move. There is even a site that has a round slide rule that you can print out on paper and slide transparencies. It amounts to a small nuke damage computer. It will help you rapidly calculate all kinds of nuclear effects. You probably know that radiation is the damage that lasts longest and goes the farthest. If you are far enough from a nukeable site, your fallout shelter's main job would be to protect you from radiation. You should make the radiation exposure device that I posted about yesterday and keep one in your shelter and in your bug out bag. If you live closer to a nukeable location you will need to prepare a shelter that will protect you from other sorts of nuclear blast damages. Here is a diagram that I drew to give you an idea of what would happen to you and the buildings around you at close distance to ground zero of a nuclear blast. My apologies for the mess. 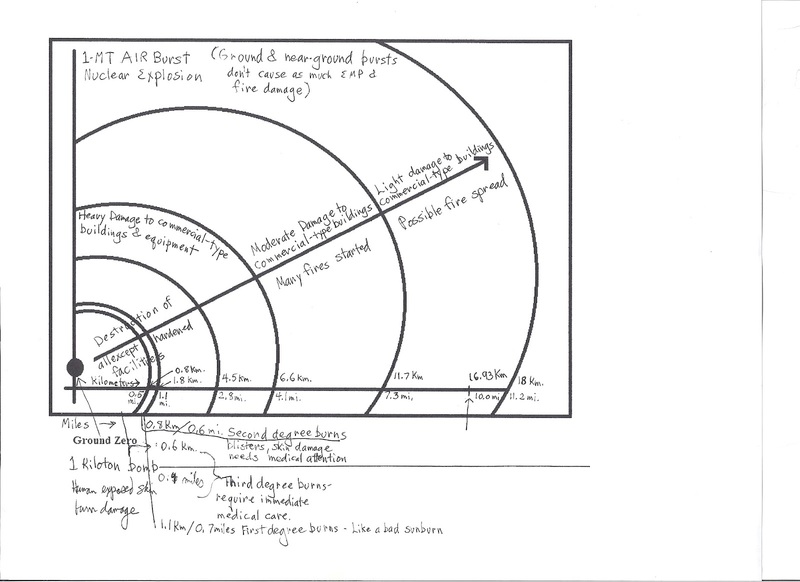 This was extraordinarily difficult to research because bomb blast effects were described using different sized bombs and air blasts versus ground ones, etc. All of the information is a very rough estimate anyway. The wind direction and weather can even make a big difference in what happens, especially to people. Bigger bombs will cause more damage, but not the same kind of damage. I gather that thermal damage and the EMP damage are the factors most increased by larger bombs. The rest of the damages are not changed that much. Here is the link to the little round paper and clear plastic computer you can make to help you calculate your local damages from a nuke blast. It is considered an historical document now, so I am not certain that it will work for bigger modern bombs. It is not so far in the past that it will not work at all, however. The book site I linked to yesterday has instructions to help you build a safe nuclear shelter. There are lots of other sites on the subject as well. I think it is a good idea to look at several before you decide what you want to build. The shelters vary quite a lot.